It has been quite a while since the latest update on the website. This was mainly due to some new exciting projects I started working on. It does however not mean that the Amsterdam by Night project has ended. In contrast: the Facebook community is growing and has almost reached 10.000 fans. Just like before, one of the subscribers to the Newsletter will win a Photobook. Be sure to subscribe via the form on the Contact page. 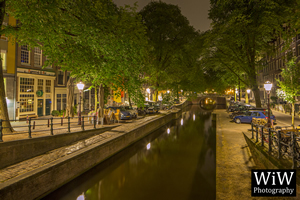 Just like last year there will be a "Amsterdam by Night" calendar for 2016, featuring 12 of the most beautiful photographs of nightly Amsterdam. The calendar provides a convenient monthly overview, including week numbering, with space to write down your appointments and notes. Last year's calendar measured (opened up) 30x43 cm, but this year the size has increased to 31,5x47 cm. This makes the photos look even more beautiful and offers even more space to write down your appointments. Since the calendars will be produced in series the expected delivery time will be about 4 weeks, but this time will of course depend on the orders. 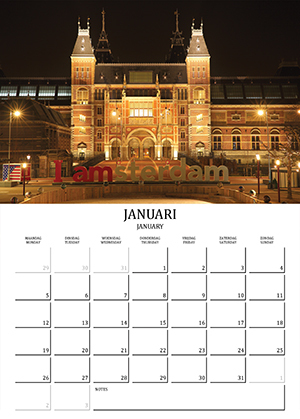 Of course we offer worldwide shipping and, as with all WiW Photography publications, this calendar is printed by Drukkerij BPR in my birthplace Wijlre. Do you want to order this beautiful calendar for your own home, or as a present to someone else? It costs 15,95 euro and you can place your order via the Webshop, or by sending a message via the Contact page. You can also make use of the special offer of ordering both the Photobook and calendar for 45,- euro (10% discount). Ps. Keep an eye on the Facebook page for some of the featured photographs! 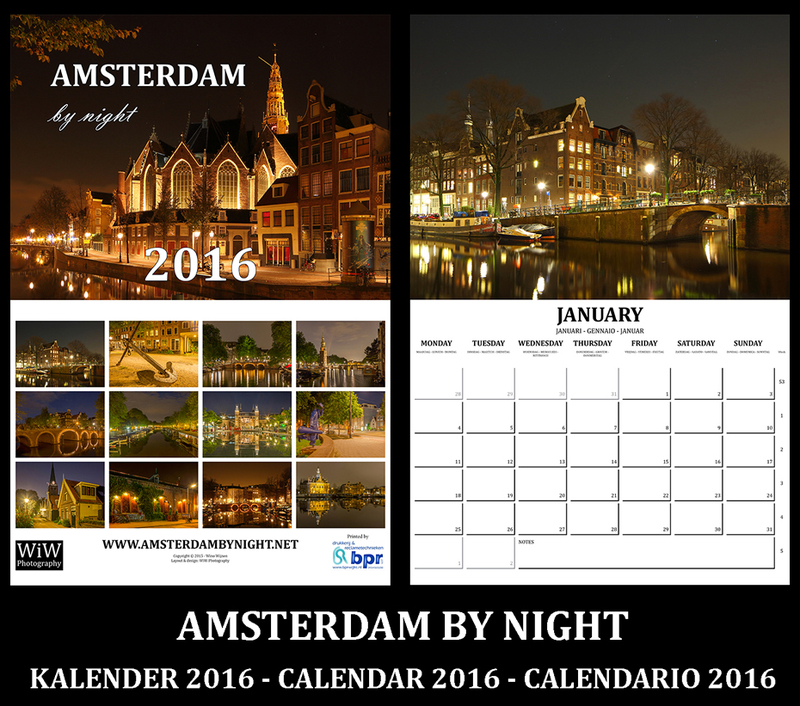 Keep an eye on the Facebook page, as soon the new "Amsterdam by Night" calender for 2016 wil be presented. Just like last year it promises to be a great publication, and I can even announce that the size will be a bit bigger. Very useful to keep track of your appointments, but also a wonderful gift. A couple of weeks ago I was contacted by the two enthusiastic ladies of Tools and Tours, a new initiative that provides tours through known, and less-well-known Amsterdam. With their Amsterdam city safari they offer the opportunity to conveniently enjoy the city, both for tourists as well as inhabitants. 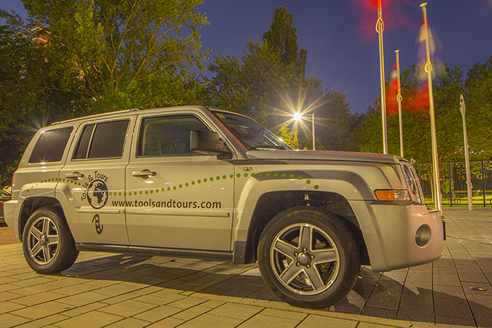 Since they offer these safaris by luxury jeep also during nighttime, they found their way to "Amsterdam by Night". Lately I have joined them on one of their nightly City Safaris, and I have to admit that it is quite an adventure to view the city by jeep. Especially their choice for the less well-known roads offered a great experience, also for those who already know Amsterdam. Highlights were some of the special viewpoints, of which several photos will feature soon on the Facebook page. For now a nightly photo of their jeep. Do you also want to explore the city? In that case I can surely recommend the tours of Tools and Tours! The answer on this weeks Quiz is Marnixstraat. These two little houses can be found at Marnixstraat near the Tweede Marnixplantsoen opposite to the blue statue of the Man with the Violin suitcase. Follow WiW Photography also on Twitter and Facebook. The answer on this weeks Quiz is the Leliegracht. 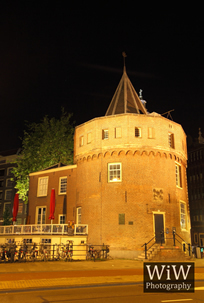 The Leliegracht is located in the city center near Westertoren, right between the Prinsengracht and Keizersgracht. It forms part of the famous 17th century canal belt. Last night I was on my way through nightly Amsterdam, with some nice new photos as a result. High on my to-do list ranked a summertime photo of Rijksmuseum, with a view over the pond at Museumplein. Upon arrival I had to wait for a while for all tourists to leave for their well-deserved sleep after a busy day in Amsterdam. My goal was to make a photo of the reflections of the museum in the water, but an artwork of the ArtZuid exhibition was blocking the view. This meant getting wet feet: take of the shoes and into the pond. Unfortunately my entrance into the water completely disturbed the beautiful reflections so there was only one solution: standing still in the cold water for about half an hour in order to let the water calm down again. Sometimes it requires a bit of patience to get the desired results. 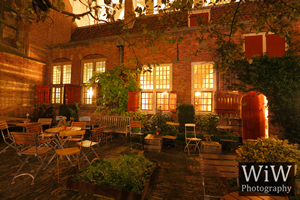 The answer on this weeks Quiz is the court garden of the Oude Kerk. The Oude Kerk is the oldest building of Amsterdam that still exists, dating from about 1306. This is the court garden which currently features the entrance to the temporary rooftop terrace. The court is home to koffieschenkerij de Oude Kerk, one of the best places to enjoy a coffee in the historic environment of the inner city. As from today the photobook "Amsterdam by Night" is also available in bookshop Libris Voorhoeve in Hilversum. Other salespoints can be found on the map below. Support your bookshop and buy the photobook locally! More than 8000 people are following "Amsterdam by Night" on Facebook. As usual we celebrate this with a gift to one of the subscribers of the Newsletter: this time Levi won a copy of the photo book "Amsterdam by Night". In addition there is a 10% discount on all purchases from the "Amsterdam by Night" Webshop. Use the following code during the payment process to access the special discount: "ABN_8000". 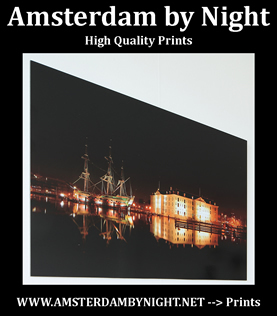 Use this offer to order the book, a poster or a luxury print of Amsterdam by Night. Many thanks to all of you for supporting this project and I am looking forward to celebrate the 9000th fan! Today the European Parliament voted against a proposal to limit the freedom of panorama in all European countries. This result was partially achieved through a petition that has been signed by more than 500.000 people. Julia Reda, the member of parliament responsible for the initial report, has written short reaction to the acceptance of the proposal. Thanks to everybody who put effort in saving the freedom of panorama in Europe! I do rather not use this page for political statements, and with all the European problems currently at play it is definitely not intended to put some extra oil on the anti-Europe fire. On the 9th of July however, there will be a discussion about new European copyright laws, in which the "freedom of panorama" might be at stake. 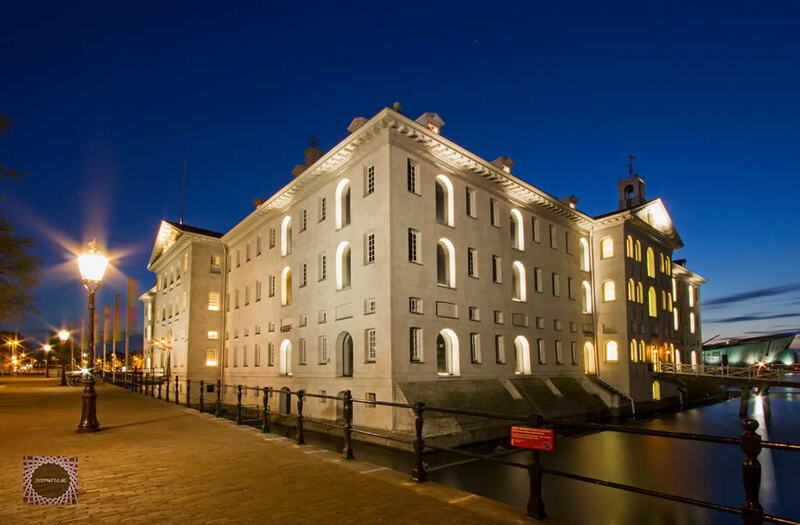 In short, the freedom of panorama allows us to photograph and publish all public buildings without any restrictions. As long as you make the photograph from public land you are allowed to use and publish it. The current report text suggests to limit this freedom in order to protect the copyright of architects and artists. If the report text would be turned into law it means that you have to obtain permission of the (authorized) rightholder before you can publish a photograph. 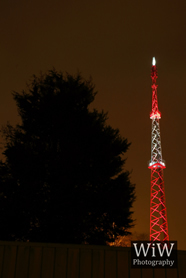 This affects Amsterdam by Night, but more importantly, it severely limits the freedom of press. That is why it is very important to show that this kind of restriction to our freedom are unacceptable. A petition has been started a few weeks ago, and by now it has been signed by more than 300.000 people. This is a very strong signal that we do not agree with implications of the current report. I am not asking you to just sign the petition, but to inform yourself about the subject. You can find more information on the website of Julia Reda, the EU parliament member that initiated the copyright reforms with the best intentions. If you find these developments troubling, you can sign the PETITION against the implications via the link. Do this, not only for the future of projects like “Amsterdam by Night”, but also to guarantee our other freedoms in the future. 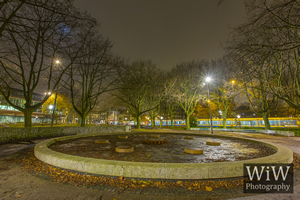 The answer on this weeks Quiz is the pond at Frederiksplein. During the 19th century Frederiksplein was dominated by the Utrechtsepoort, one of the city gates of Amsterdam. In 1864 the square was renovated and the huge "Paleis voor Volksvlijt", inspired on Chrystal Palace in London, was completed. This building burned down in 1929 and was never renovated. Currently, Frederiksplein is dominated by a park and the headquarters of the Nederlandse Bank. The answer on this weeks Quiz is the marine etablissement at Kattenburg. 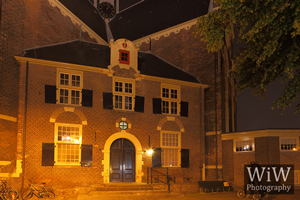 In 1655 the admirality of Amsterdam was housed in the Zeemagazijn (currently in use as the scheepvaartmuseum). A shipwharf developed on the terrain next to it. Since military vessels became larger and larger, they didn't fit through the canals and locks. Therefore, the wharf was relocated to Den Helder in 1915, and since than the complex has been in use as a training facility of the Dutch navy. Due to budget cuts on defense, the terrain will soon lose its military function. The last couple of weeks have been quite again on the website. Amsterdam by Night did move forward however: there have been two book presentations on the 28th and 29th of May. On Thursday I gave a talk about the project in the American Book Center at Spui in Amsterdam. Many thanks to all the people who joined! On Friday it was the "Amsterdam night of the book" (Amsterdamse boekennacht). This evening I participated in the "living magazine" Peppy Miller in the Athenaeum Newscenter at Spui. This too was a great evening and I want to thank the audience for being there! If you did not manage to get your copy of the photobook yet you can order it online at the American Book Center, or via the Athenaeum Webshop. The answer on this weeks Quiz is the Rapenburgwal, photographed from the Peperbrug. This canal is the northern border of the island Uilenburg. The Peperbrug, together with the Keizersbrug and the Steenvoetsluis, is one of three bridges that connect the island to the rest of the city. The island was constructed between 1591 and 1593 as part of the "tweede uitleg", one of the many expansions of Amsterdam. 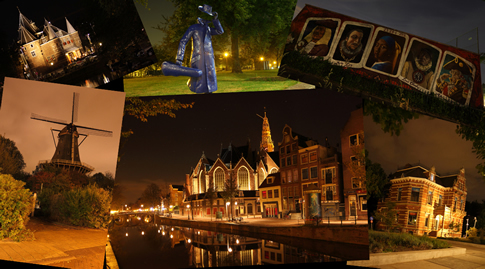 This weekend celebrates the Dutch National Windmill Days, and Amsterdam by Night also loves these monuments. It is possible to visit some windmills and learn more about their history. Amsterdam has only eight windmills left, do you recognize them all? Read more in the Spotlight "Windmills". 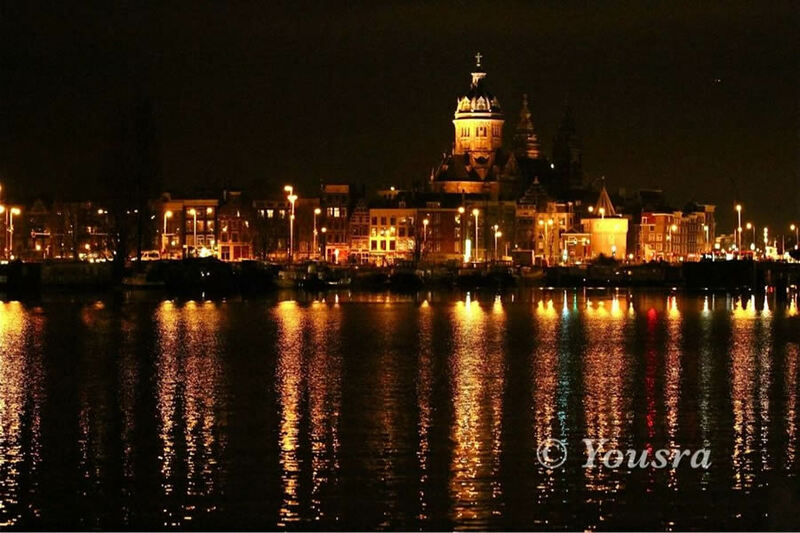 9-5-2015: "Your Amsterdam by Night"
This week in "Your Amsterdam by Night" a photograph that was shared by Jvsphoto. 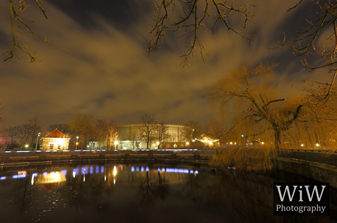 Thanks for participating with this beautiful photograph of the Scheepvaartmuseum and keep enjoying the night! Do you also want to be featured in "Your Amsterdam by Night"? 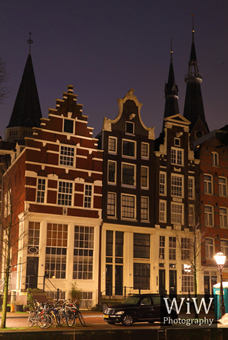 Share your photos of nightly Amsterdam on the timeline of the Amsterdam by Night Facebook page. The answer on this weeks Quiz is the Vredeskerk, situated along the Hillegaertstraat in the Pijp. 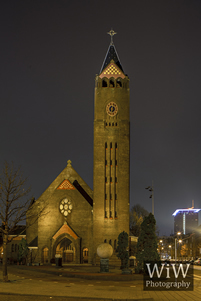 The church was constructed between 1923 and 1924 as part of Berlage's city expansion "Plan Zuid". The design is by architect Jos Bekkers. Its dedication as Vredeskerk (Peace church) to Our-Lady Queen of the Peace was a consequence of the recent end of the First World War. 1-5-2015: "Your Amsterdam by Night"
The basilica of Saint Nicholas is a very popular subject among the fans of Amsterdam by Night. 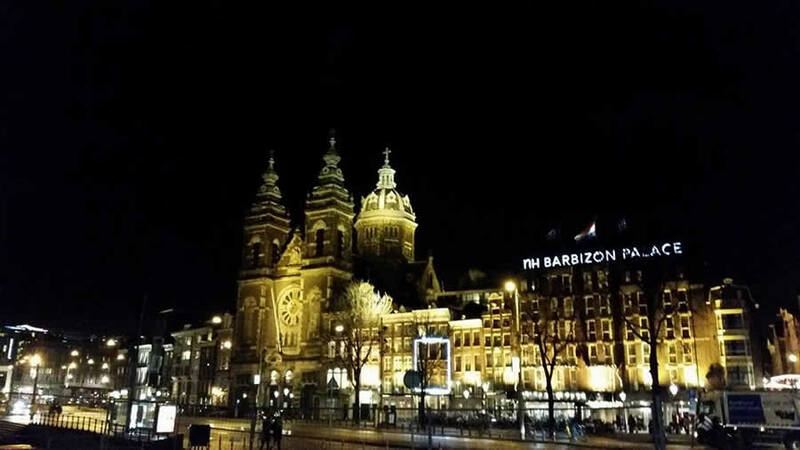 This week in "Your Amsterdam by Night" a photograph that was shared by Dennis. Thanks for participating and keep enjoying the night! This year the 7th edition of the Amsterdamse Boekennacht will be celebrated on the 29th of May. Of course Amsterdam by Night will also be there and in the evening I will give a short impression about nightly Amsterdam in the Athenaeum Nieuwscentrum at Spui. More news will be available soon, but be sure to mark the date in your agenda. On the 28th of May from 19:00 onwards I will give a presentation about "Amsterdam by Night" in the American Book Center in Amsterdam. The presentation will be given in English, and will offer an overview of the rich history of the city based on the Photobook "Amsterdam by Night". The presentation is not only a great introduction for newly arrived expats, but also for people who have been living in the city for years. After the presentation there is more than enough time for a talk and I will be happy to sign the book. I hope to see you all in the American Book Center. More information can be found on Facebook and the website of the American Book Center. The answer on this weeks Quiz is the Lijnbaansgracht along the edge of the Jordaan. The Lijnbaansgracht was constructed simultaneously with the 17th century canal belt and ran all the way from Brouwersgracht to Muiderpoort. The name is derived from the rope-makers, a thriving industry that made ropes for the shipyards, which was located along the outskirts of Amsterdam. 24-4-2015: "Your Amsterdam by Night"
This week a new post for the "Your Amsterdam by Night" series. Elly Snijder shared this view of the Saint Nicholas basilica at the Prins Hendrikkade. Thanks for participating en keep enjoying the night! 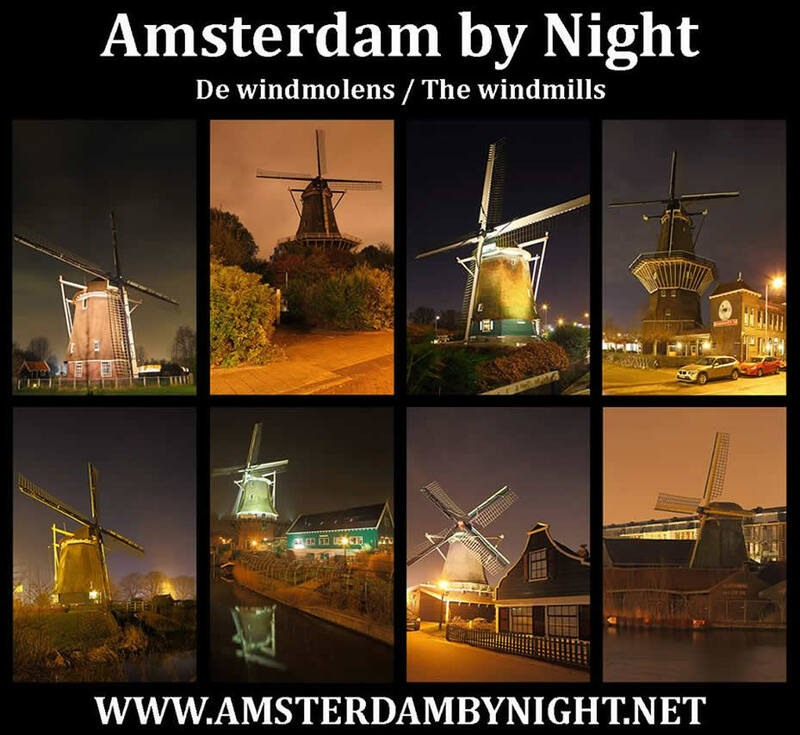 21-4-2015: Your "Amsterdam by Night"
Time to reinvigorate the "Your Amsterdam by Night" section, and therefore I am curious about your view of nightly Amsterdam. Place your photographs on the timeline of the Amsterdam by Night Facebook page and share the beauty of nightly Amsterdam with the fans of Amsterdam by Night. On Fridays I will share the most beautiful photos via this website and the facebook page. Show us "Your Amsterdam by Night"! The answer on this Sunday's quiz is "De Titaantjes" (little titans) in Oosterpark. 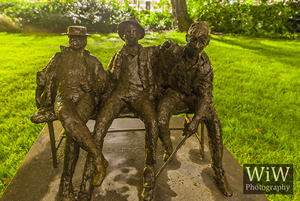 This statue represents three characters from the novel "De Titaantjes" by Dutch writer Nescio, who was born in Amsterdam. The statue was made in 1971 by sculptor Hans Bayens. The answer on this Sunday's quiz is the Nieuwendammerdijk, with a view on the church of Nieuwendam. Nieuwendam was an independent municipality on the northern banks of the river IJ. In 1921 it was annexed by Amsterdam, that was quickly expanding in Noord. 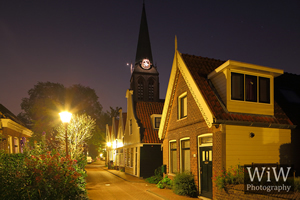 The village, and mainly the Nieuwendammerdijk, still maintains its rural atmosphere. 11-4-2015: Photobook "Amsterdam by Night"
This week I was informed by the American Book Center at Spui that they almost ran out of copies of "Amsterdam by Night". No worries, as the stock will be replenished soon. The book is also available at other bookshops in and around Amsterdam, even as far as Zurich in Switzerland. Have a look at the map below for all sales points, or order this unique book via the "Amsterdam by Night" Webshop. The answer on the quiz from last weekend is a view over the Keizersgracht from the Raadhuisstraat, close to Westerkerk. The Keizersgracht is one of the three main canals that form the historic canal belt of Amsterdam. It runs in between the Herengracht and the Prinsengracht. This week on Saturday, but still a quiz this weekend. 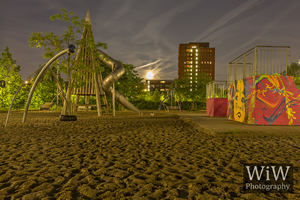 The proper answer is the playground in the Gerbrandypark, just outside the ring in Amsterdam-West. The park was constructed between 1957 and 1965, when the city was expanding outside the ring. The playground was partly funded by the Richard Krajicek Foundation, a foundation that promotes young people to sport. This week another question for the quiz. The correct anwer is the Spuiplein in the center of Amsterdam. On this foto we enjoy the view towards the Begijnhof, a little inner garden that dates back to the middle ages. This week a more comprehensive quiz. 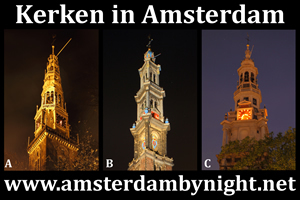 The right answer is: A. Oude Kerk, B. Westerkerk, C. Zuiderkerk. The Oude Kerk from 1306 is the oldest existing building in Amsterdam. The tower of the Westerkerk is with 87 meters the highest churchtower in the city, and the Zuiderkerk was built in 1614 as the first Protestant church. This week I hope the quiz wil be a bit more challenging. The right answer is the antenna at the Nieuwe Hemweg close to the Neptunushaven. Everybody is also invited to join the lecture in Koffieschenkerij de Oude Kerk at the 26th of Februari. I will give an overview (in Dutch) of the rich history of Amsterdam through the photographs of Amsterdam by Night. More information on Facebook. Follow WiW Photography also via Twitter. 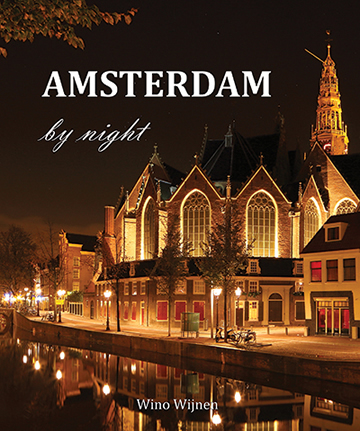 21-2-2015: New shops offering "Amsterdam by Night"
Last week a couple of bookshops have been added where the Photobook "Amsterdam by Night" is available. From now on the book is also for sale in the middle-east of the Netherlands: Nijmegen, Arnhem, Apeldoorn, Oosterbeek, Wageningen and Zutphen. Have a look at the map below for an overview of all shops that have "Amsterdam by Night" available. Support your local bookstore and get your copy of the book in one of those shops. Please contact the shop to be sure that the book is in stock. 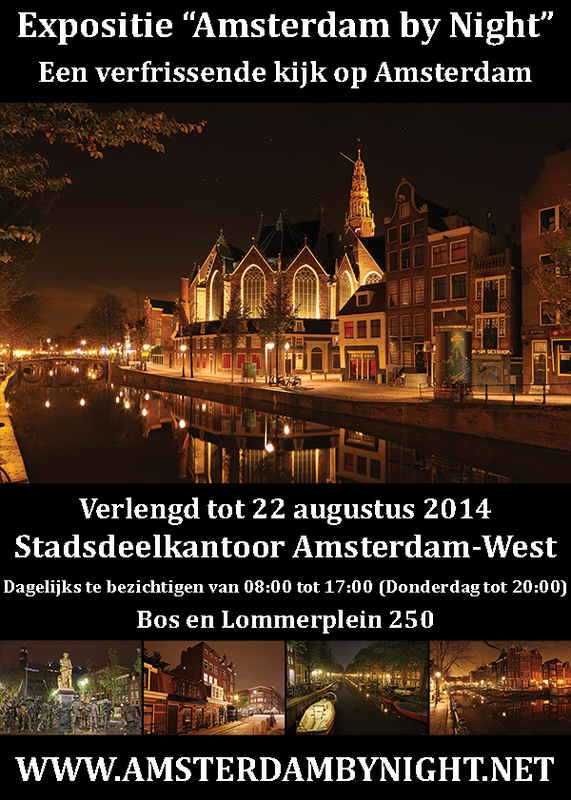 18-2-2015: Lecture "Amsterdam by Night - Stad in Vogelvlucht"
On the 26th of Februari I will give a lecture about "Amsterdam by Night" in Koffieschenkerij de Oude Kerk. During the lecture we will take a closer look at the rich history of the city, all based on the nightphotos from "Amsterdam by Night". The lecture will be given in Dutch and will take about 1,5 hour. In between we will have a short break. Entrance is free, but due to limited space we would like to hear who will be joining. Seats will be reserved based on the order of notice. Please Contact me or let me know if you will join via the Facebook Event. I hope to see you on the 26th of Februari! 16-2-2015: 10% Discount Photobook "Amsterdam by Night"
Of course the book is also available in a select number of bookshops. 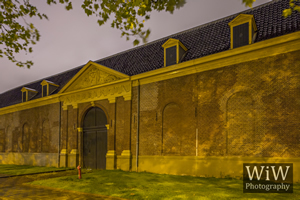 15-2-2015: Lectures "Amsterdam by Night"
Tuesday the 24th of Februari I will organize a lecture about "Amsterdam by Night" in the Wielderhoes in Wijlre (Zuid-Limburg). Thursday the 26th, another lecture will be held in Amsterdam. The evening will be organized in Koffieschenkerij de Oude Kerk. During the lectures I will discuss the history of Amsterdam by showing the photos of nightly Amsterdam. More details will be available during this week, but the dates can already be put in the agenda. The answer to the Quiz of this week is the Hygieaplein in Amsterdam Zuid. This square is located along the Marathonweg. The square is flanked by several apartment complexes and a primary school. Follow WiW Photography also on Twitter. The anwer to this weeks quiz is the Muiderpoort, in the vicinity of the Tropenmuseum in Amsterdam-Oost. This city gate was constructed as part of the last city wall of Amsterdam. Just as with the medieval city walls, very little remains except for the gate. In 1811, emporer Napoleon entered Amsterdam through this gate. 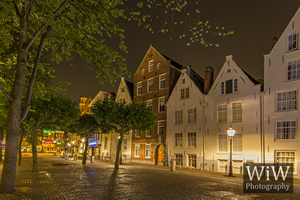 As from today Amsterdam by Night has been integrated in the fully renovated WiW Photography Webshop. From now on, this is your place to order the Photobook, prints, posters and postcards. Payments have been integrated and can be fulfilled via either Paypal or creditcard. Be sure to have a regular look at the shop, as the prints on offer will be regularly updated. Feel free to Contact me if you have any questions about the new Webshop. The anwer to this weeks quiz is the apartment complex at the Ertskade in Zeeburg. 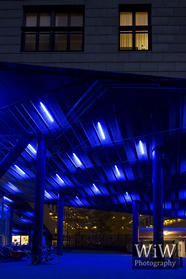 The entrance to this building at the corner of the verbindingsdam towards the KNSM eiland is lit up in blue. The anwer to this weeks quiz is the Kromboomsloot in the Nieuwmarktbuurt. This photo is taken from the street along the canal. In the background you can see the apartment complex along the Sint Antoniesbreestraat. The name of the Kromboomsloot refers to the 16th century mayor C.P. Boom. Because the canal is curved it is called the Kromboomsloot (krom is Dutch for curved). Until the 20th of February, an exhibition of "Amsterdam by Night" can be viewed in the Stopera at Waterlooplein. A small selection of photos is on display on the "red wall" in the hallway towards the Opera. Be sure to pass by if you happen to be near. The answer to the Quiz of this week is the Noorderkerk. This Protestant church at Noordermarkt was built between 1620 and 1623 for the inhabitants of the new working class district de Jordaan. 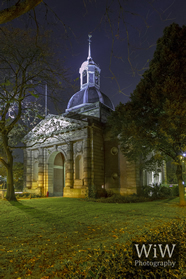 Read more about the history of this building in the Spotlight about Noorderkerk. For all the Swiss Amsterdam by Night fans or Dutch people living in Switzerland: as from today, the Photobook "Amsterdam by Night" is also available in the Travel Book Shop in Zurich. Be sure to go and have a look in this great shop in the old city center. Have a look at the Photobook page for other sales points or to order via this website. The book costs 35,- euro (CHF 42,-) with free worldwide shipping. 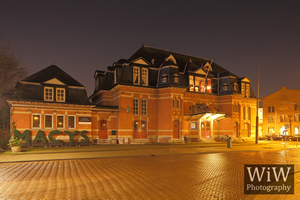 The answer to the Quiz of this week is the Haarlemmermeerstation, at the Amstelveenseweg. The station was completed in 1915 as the final stop on the railway from Aalsmeer to Amsterdam. The Haarlemmermeerstation was decommissioned in 1950. This foto is also featured in the Photobook "Amsterdam by Night". 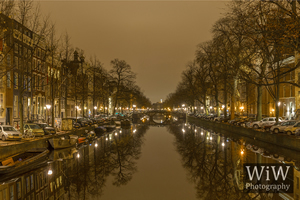 10-1-2015: Winner Photobook "Amsterdam by Night"
To celebrate the 7000th follower on the Facebook page Eric won a copy of the Photobook "Amsterdam by Night". The happy winner received the book last week. If you also want to have a chance to win the book you can subscribe to the newsletter via the Contact page or place an Order in the webshop. 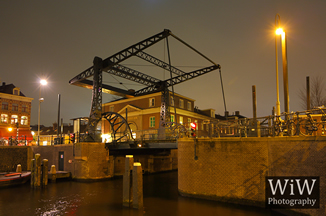 The answer to the quiz of this week is the Kostverlorenvaart, at the crossing with the Jan van Gaalenstraat. The Kostverlorenvaart was dug out to make a connection between the Schinkel and the IJ. In the 17th century, this canal was located outside the city walls and flanked by many windmills, among which sawmill "De Otter". By now 2015 has already started, the third year that "Amsterdam by Night" is online. Last year was a great year. There have been the exhibitions in Stadsdeelkantoor-West, during the election evening of the night-mayor in Trouw and since last week in the city hall (Stopera). I have also enjoyed the book presentation of the Photobook "Amsterdam by Night" in the Schreierstoren and the lecture in Wijlre. More and more people follow the project via the Facebook page, and the Spotlight section of the website has been updated to a new format. I'm looking forward to this year and hope that you keep enjoying nightly Amsterdam. A big thanks to everyone who has supported this project by ordering the photobook or the calendar (sold out) / postcards / prints! Without you this would not have been possible. I wish you all a happy 2015 in good health and hope that the coming year will bring good fortune! The right answer to the quiz of this week is the lakes of the old gas holders in Westerpark. When the Westergasfabriek was decommissioned several gas holders (in which the gas was stored) were demolished. When the whole area was refitted as a park, the foundations of two of the structures where used to create two lakes. In the background of the photo we see the remaining gasholder that was left. Read more about the gas production in the photobook "Amsterdam by Night". 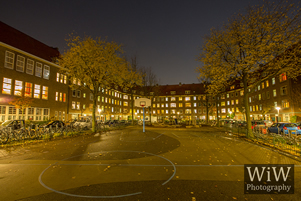 The right answer to the quiz of this week is the Rembrandtpark in Amsterdam West. The sculpture is called "Rembo", a design by Bastienne Kramer that was placed in 2005. The statue had to be vandalism-proof, and any damage of the green ceramics would be replaced with bronze. This makes "Rembo" an organic sculpture that slowly changes in time (or not of course). Read more about Rembrandtpark and the statue in the Spotlight about Rembrandtpark. 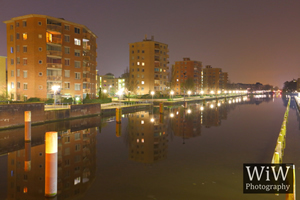 12-12-2014: Presentation "Amsterdam by Night" & "Nightphotos"
On Friday evening 19th of December, from 21:00 onwards the photobook "Amsterdam by Night" will be presented in Cafe Hazen-Wijnen in Wijlre (Zuid Limburg). After the official book presentation on the 2nd of December in the Schreierstoren in Amsterdam I want to use this occassion to present the book in my birthplace. Besides a view of nightly Amsterdam I will also present the new website www.nightphotos.net. The evening will therefore feature a bit more of the night than only Amsterdam and everyboy is invited to join. Follow the Facebook Event for additional updates. 12-12-2014: 7000th Facebook Fan "Amsterdam by Night"
Today, Amsterdam by Night could welcome the 7000th fan on Facebook. Another great milestone, and a great sign of your appreciation for the project. For the occasion one of the subscribers of the Newsletter wil win a copy of the Photobook "Amsterdam by Night". The lucky winner will be announced during the coming days. All fans: Thank you very much!!! Today in "Your Amsterdam by Night" a beautiful blog about the Amsterdam Light Festival, written by Delphine Gidoin. Read the post "Light Festival and other Fairy Tales" via the following Link. 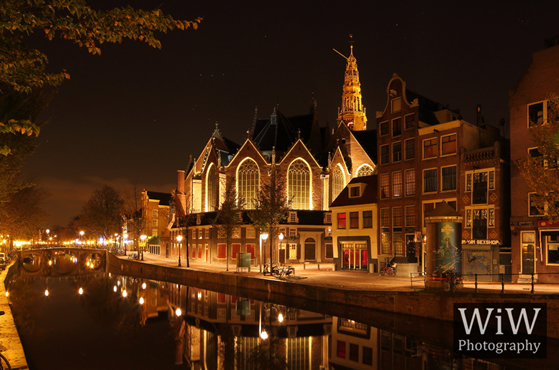 Do you also want to be featured in Your Amsterdam by Night? Post your nightphotos on the timeline of the Facebook page. You had to wait a bit for the answer on the quiz, but this photo shows the Tropeninstituut, seen from the back from Oosterpark. Last week it was finally ready: after a year of preparations the photobook "Amsterdam by Night" could be presented to the world. By now the book can be ordered via the Photobook page of this website and it is available in several shops in and around Amsterdam. It turned out to be a busy week: delivering all the books in the shops, the book presentation and exhibition of last Tuesday and the processing and sending of all the orders that came in via the website. Unfortunately I did not have enough time to update the website and facebook page. From now on we continue with new Spotlights and photos on the Facebook page. Enjoy "Amsterdam by Night" and many thanks for all your great comments to the project! 1-12-2014: Salespoints "Amsterdam by Night"
Amsterdam by Night is not only available via this website (via Photobook), but also in the better book shops in and around Amsterdam. The photobook is available, or can be ordered, at the following locations. The ones indicated in green have more than 10 copies in store; in orange have 5 or less, and in red it is still not available. The book can be ordered via all these shops and will be delivered as soon as possible. Please contact the shop to be sure that the book is in stock. On the 2nd of December the photobook "Amsterdam by Night" will be presented in the Schreierstoren in Amsterdam (Prins Hendrikkade 94-95). This evening there will also be an exhibition of "Amsterdam by Night". 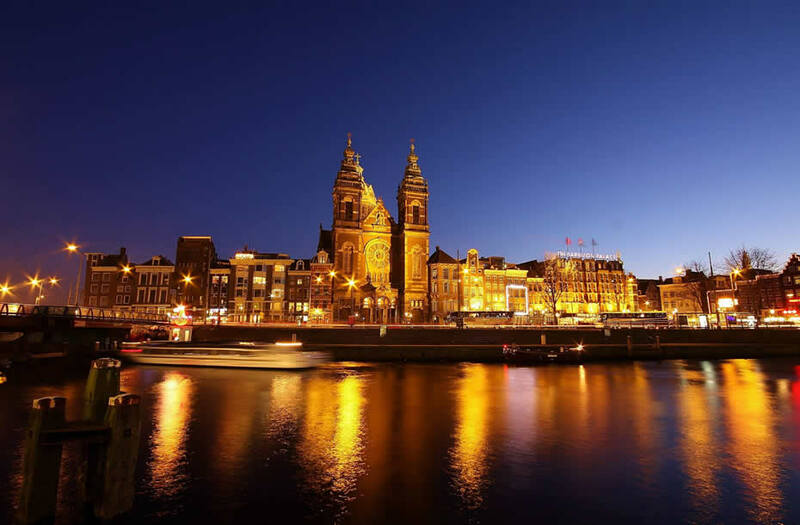 During the evening I want to take you on a nightly journey through the history of Amsterdam. Everyone is welcome from 19:30 onwards, and the entrance is free. Have a look at the invitation on Facebook and let me know if you will be joining. For pre-ordering the photobook you can have a look at the Preview and order via the form on the Photobook page. The book is only available in a limited edition so be sure to order in time. Stay tuned via Facebook and Twitter, or subscribe to the Newsletter. As from today the Spotlight on this website has been refitted. Via an interactive map it is now possible to view the photos of nightly Amsterdam, with links to background articles. The coming weeks I will place the old Spotlights in this new format and also add some new articles. You can already have a look at the updated articles about the "Oude Kerk" and the "Windmills". Enjoy! Because of all the updates it could happen that some links are not working properly. Please let me know via the Contact page and I will try to fix it as soon as possible. 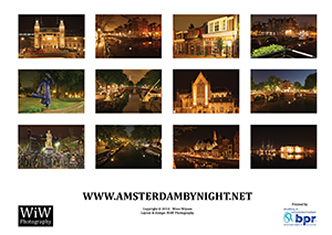 As of today the "Amsterdam by Night" calendar for 2015 is officially available, exclusively via this website. 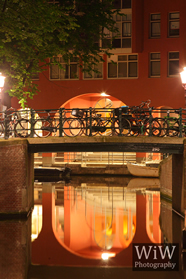 The calendar features twelve photographs of nightly Amsterdam and shows the city at its best. Besides the photos, the calendar offers convenient space for keeping track of your appointments, including room to put montly notes. Order your copy via the Prints page, either for yourself or to give away as a special present. Marianne won this luxury 40x60 cm print on DiBond to celebrate the 6000th follower on Facebook. Since she ordered the photobook "Amsterdam by Night" and participated in the lottery. She chose for this luxury print of the "Saint Nicholas Basilica", worth 250,- euro. Do you also want to have a chance to win such a nice print? Order the Photobook, or subscribe to the Newsletter. Who knows you will be the next in the list of happy winners, as Jeroen, Richard and Jolanda previously won a print of the "Onderzeeboot", "Papiermolensluis" and "Westertoren". 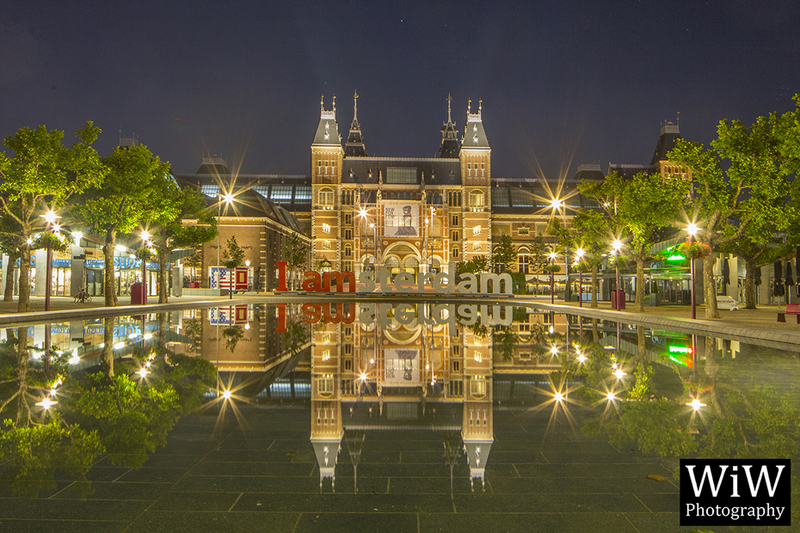 Today Amsterdam by Night celebrates its first birthday on Facebook. It is exactly one year ago that the page went online and during this time more than 6000 people are regularly enjoying from some bits of nightly Amsterdam. Follow the page and stay tuned about everything regarding Amsterdam by Night. The question was were this photograph was taken. Based on the answers that you gave on Facebook I didn't make it too difficult this time. The right answer is indeed the Schippersgracht close to the Kadijksplein. In the foreground we see the Scharrebiersluis while the entrepot is visible in the backgorund. Amsterdam Centraal was the first to have an interview about "Amsterdam by Night". In a nice talk with Tomas Dulfer we discussed about the backgrounds of the project. Read the full interview at Amsterdam Centraal (unfortunately only in Dutch). Today in "Your Amsterdam by Night" a beautiful photo of the monument Indie-Nederland (Olympiaplein), made by Corrie de Gier-de Vries. Also in Your Amsterdam by Night? Post your nightphotos on the timeline of the Facebook page. I'm very happy to announce that mr. E.E. van der Laan, mayor of Amsterdam has written the preface to the photobook "Amsterdam by Night". Have a look at the Photobook page to see what he has to say about the book. 07-11-2014: 6000 Facebook Fans "Amsterdam by Night"
Today, Amsterdam by Night has welcomed the 6000th fan on Facebook. Another great milestone, and yet another reason to keep you treating on nigthly Amsterdam. For the occasion one of the subscribers of the Newsletter wil win a luxury print. Additionally, this might be a nice reason to order the Photobook, as the limited edition is becoming more limited every day. Today I even received an order from the other side of the world, and the book will be available in several stores and museums from 2 December onwards. Spread the word: we are slowly moving towards the 10.000 :). The question was where has this photograph been taken. The right answer is along the Korte Prinsengracht in the Haarlemmerbuurt. In the background you can see the towers of the 19th century Posthoorn church. This was the first church in Amsterdam that was designed by Pierre Cuypers. Later, this architect also designed the Central Station, the Rijksmuseum and the Vondel church. The building was finished in 1889. 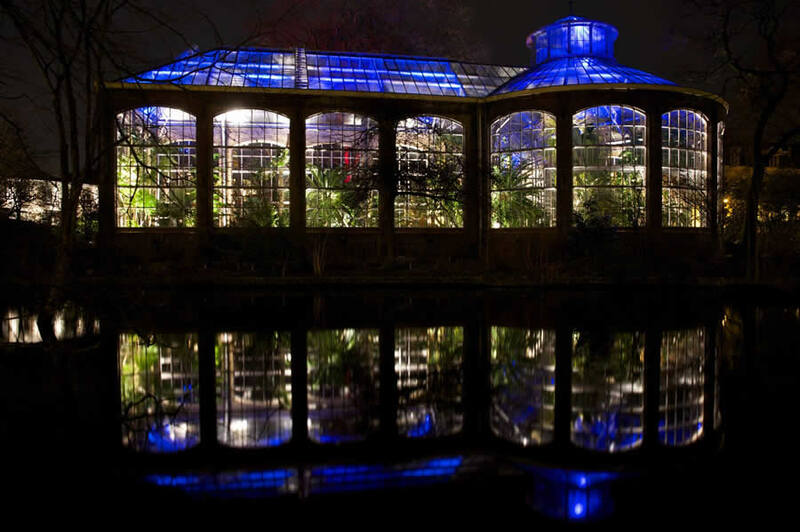 Today in "Your Amsterdam by Night" a beautiful photo of the Hortus Botanicus, made by Paul Steman during the previous Amsterdam Light Festival. Also in Your Amsterdam by Night? Post your nightphotos on the timeline of the Facebook page. On the 2nd of December the photobook "Amsterdam by Night" will be presented in the Schreierstoren in Amsterdam (Prins Hendrikkade 94-95). During this evening I want to take you on a nightly journey through the history of Amsterdam. Everyone is welcome from 19:30 onwards, and the entrance is free. Have a look at the invitation on Facebook and let me know if you will be joining. For pre-ordering the photobook you can have a look at the Preview and order via the form on the Photobook page. The book is only available in a limited edition so be sure to order in time. Starting from this week a photo of an Amsterdam by Night Fan will be published weekly on the website. We start with this view of the Saint Nicholas Basilica, made by Yousra. Also in Your Amsterdam by Night? Post your nightphoto on the timeline of the Facebook page. Jeroen won this luxury 40x60 cm print on DiBond to celebrate the 5000th follower on Facebook. 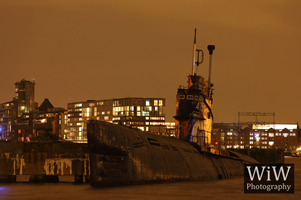 As a subscriber to the Amsterdam by Night Newsletter he participated in the lottery and he chose for this luxury print of the "Onderzeeboot" (Submarine), worth 250,- euro. Do you also want to have a chance to win such a nice print? Order the Photobook, or subscribe to the Newsletter. Who knows you will be the next in the list of happy winners, as Richard and Jolanda previously won a print of the "Papiermolensluis" and "Westertoren". Dear followers of Amsterdam by Night, your response to the preview of the photobook is overwhelming! To everyone who I couldn't personally reply yet, I want you to know that your messages are greatly appreciated. When I started this project it was mainly for my own satisfaction, but to see that so many others also enjoy the photographs is totally amazing. As you have seen the cover design is as good as finished, and the next two weeks are meant for the final completion of the photobook. Although I almost can't resist to go out and take some more photos, I am spending all my time trying to make everything perfect. At once I realized that I'm not only making this photobook for myself, but mainly for you. I therefore truly hope to fulfil, and maybe even exceed, all your expectations. Thank you for all your reactions! Read more about the book on the Photobook page. 10-10-2014: Preview and Pre-order Book "Amsterdam by Night"
After many hours of photographing, reading, writing, layout design and adjusting I am very happy to share the result with you: as of today it is possible to have a glance at the photobook "Amsterdam by Night". The PREVIEW can be viewed as a PDF and gives a small impression of the content of this 152 pages book with more than 100 photographs of Amsterdam during the night. You can order the book for only 35,- euro via the Photobook page. "Amsterdam by Night" is independently published, so it is limited available. Order this unique photobook today and you will be one of the first to whom I can hand over "Amsterdam by Night" at the beginning of December. Have a nice read and spread the word! Utrecht at Amsterdam by Night?? This time I make an exception, as we all love the night. I really enjoy the beautiful evening- and nightphotos of "Donker Utrecht", a project by Merijn van der Vliet. By now he has made more than 600 photos of Utrecht during the night, and he would like to create a special website and a series of postcards via crowdfunding. Just like "Amsterdam by Night" earlier this year, he is funding his project via VoordeKunst. As fans of nightphotography, he can always use your support. Have a look at the facebook page of his project and support him via VoordeKunst. Every donation will be rewarded with a unique gift. 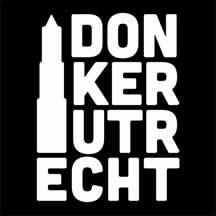 Support Merijn and his Donker Utrecht project! 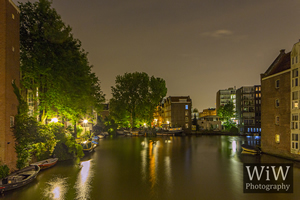 Since yesterday it is possible to follow WiW Photography, and thereby also Amsterdam by Night, via Twitter. I'm looking forward to share my (night)photos with you under the name @WiWPhotography. The content will feature cities, landscapes and nature, both during day and night. No worries, there will be plenty of great photos of nightly Amsterdam. The first Tweet is already an old favorite. Have a look and follow me on Twitter. 06-10-2014: Latest News Photobook "Amsterdam by Night"
It's already two months ago that I wrote about the progress of the photobook, and today I want to give a short update. At the end of this month the book goes to the printer, and there are still some final points that require my attention, mainly regarding the layout and the design of the cover. Besides, I still have to make some final decisions about the final content, as there is just too much to tell about the history of Amsterdam. Luckily, the project is progressing steadily so all the deadlines seem to be doable. Unfortunately, the publication of the weekly Spotlight suffers a bit from all the other work, so it will be published a bit less regular during the coming weeks. Since the photobook is published independently, only be a limited amount of "Amsterda by Night" will be available. From coming Friday it is therefore possible to put a reservation on your copy of the book, so that you will be sure to have one. Be sure to keep an eye on the website to order this unique work. 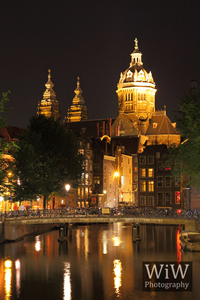 Follow "Amsterdam by Night" on Facebook or subscribe to the newsletter to receive the latest news. I received a message from an alert visitor that several links to external websites were not functioning properly, giving a 404 error. By now all the problems should be solved, but if you experience any inconveniences with the visiting or viewing of www.amsterdambynight.net, please don't hesitate to bring it to my attention via the Contact page. Last week we welcomed the 5000th follower on the facebook page of Amsterdam by Night. To celebrate this milestone a 40x60cm luxury print worth 250,- euro was alloted among the subscribers to the Amsterdam by Night newsletter. As soon as a choice for the print is made it will be announced here. Do you want to have a chance to win one of these beautiful prints? Subscribe to the Amsterdam by Night newsletter at the Contact page. Of course you can also order these amazing prints of nightly Amsterdam via the Prints page of this website. The revenue will be used for the publication of the photobook "Amsterdam by Night", that is independently published and will be send to the printer by the end of October. Hereby I want to thank all the fans of Amsterdam by Night for their support to the project! Last night Mirik Milan was re-elected as Nachtburgemeester (night mayor) of Amsterdam in Trouw. The new night mayor was elected iIn the presence of (day) mayor Eberhard van der Laan, who also brought his Athenian collegue Giorgos Kaminis for the occassion. Amsterdam by Night took care for a fitting decoration of the election night. I would like to thank everyone for having a look and the nice comments about the project! I'm also very happy that the print of Oude Kerk was immediately sold to an enthousiastic buyer. The revenue was fully donated to the Nachtburgemeester Amsterdam society. 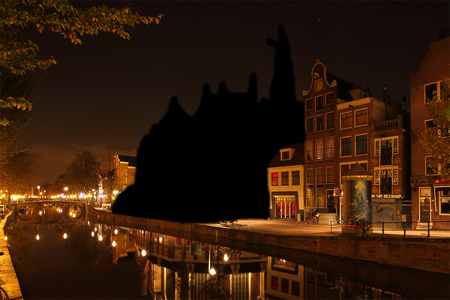 On Thursday 18th of September, Amsterdam choses a new night mayor (nachtburgemeester). Current night mayor Mirik Milan, Kolja Verhage and Ronal Offerman compete for the position. The candidates present their program and vision on the Amsterdam nightlife during the election evening in Trouw. Afterwards, the new night mayor will be elected. The election evening will be decorated with a couple of prints of "Amsterdam by Night". See you tomorrow! 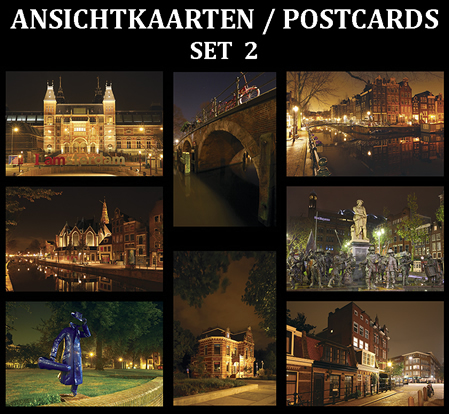 Have a look and buy these nice postcards of "Amsterdam by Night". The revenue of the sales will be used for the publication of the photobook "Amsterdam by Night", that will be published at the end of 2014. To make the photobook "Amsterdam by Night" I take a regular dive into the history of the city. Usually I get my information from books and articles, but the internet also offers a great source of facts and speculations. Many times different sources state different dates for a certain occassion (see the discussion about the founding of the Vondelpark, or the official construction date of the Oude Kerk). For the book I try to read as many sources as possible to get the closest to the "truth". Sometimes during this search I run into something that I would like to share with you. The city archives (stadsarchief) provides a lot of information and old images of Amsterdam. Several weeks ago I stumbled upon the website of Theo Bakker. This page offers a tremendous amount of information about the history of the city and I would like to mention this site to anyone who want to read up on the history of Amsterdam (unfortunately the site is in Dutch, so it's good study material for all English speakers among us). The weekly Photoquiz also offers a refreshing view of the city. Go and have a look! 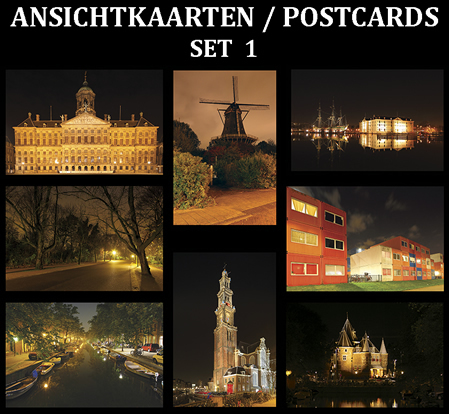 Since today 25 different Amsterdam by Night postcards are available. They can be ordered as a complete set (25 cards for 20,- euro) or as individual cards. Individual cards costs 1 euro a piece with a minimum order of 10 cards (0,80 euro per card for orders of 20 postcards or more). As usual, the cards will be delivered free of charge. Have a look at the available cards and order your own set at the Prints page. A week with some nice numbers is always something to celebrate. Today, the 100th photo of the year was placed on the Facebookpage of Amsterdam by Night: A beautiful image of the Eenhoornsluis with a view towards Westertoren. Also, last Sunday the 20th Spotlight was published on the website. I used the occassion to update the prints database with the most recent photographs of nightly Amsterdam. 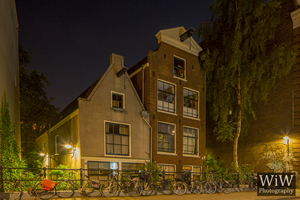 Do you want to enjoy Amsterdam by Night at home or in the office? Order one of those nice prints, thereby also supporting the publication of the photobook. 09-08-2014: Update Photobook "Amsterdam by Night"
A lot is going on behind the scenes of the photobook "Amsterdam by Night". Today a short update about the progress. As announced, the photos of nightly Amsterdam will be accompanied by texts about the history of the city. It takes quiet a bit of background research and I always find out some new facts about the city. It is going to be a challenge to make a final selection for the book. It is also a process that requires a careful evaluation of all the photographs, as the book is more than a collection of fancy pictures and also has to tell a story. Therefore I will probably keep going for many more nightly strolls to collect all the neccessary photos. Finally the layout is also slowly taking its definitive shape, as nice pictures and interesting texts represent only the first part of a photobook. Since there where a lot of non-Dutch speaking supporters of the project at VoordeKunst I also decided to make the book bilangual in Dutch and English. Via this section of the site I am regularly going to keep you up to date about the progress of the book. Also, if you think there is something about nightly Amsterdam that should definitely be included in the book, please let me know via the Contact form and it might end up in the book. For now I wish you a good night, Wino. Since 3 weeks you can see an exhibition of "Amsterdam by Night" in the hall of stadsdeelkantoor Amsterdam-West. Showcased are 16 diverse prints that show a refreshing view of the city. This week came the nice news that the exhibition will be extended till the 22nd of August. 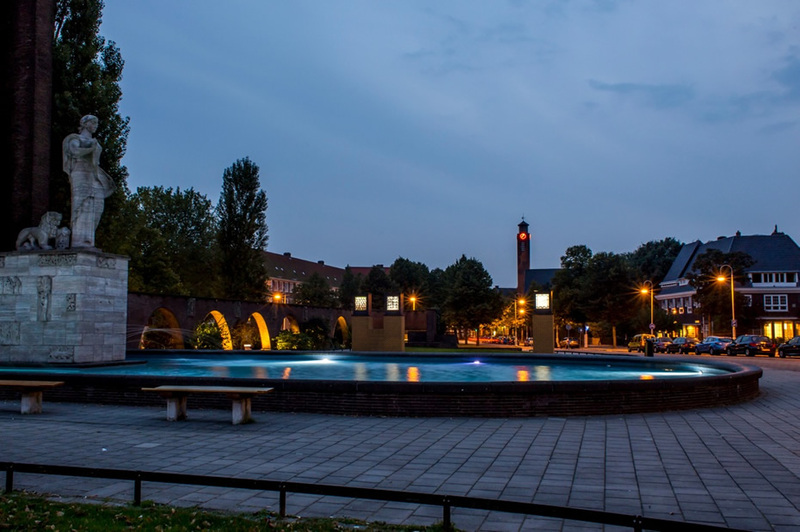 So you can still visit "Amsterdam by Night" during the next month at Bos en Lommerplein 250 (open daily from 08:00 till 17:00, thursdays till 20:00). The last couple of weeks is has been quiet intense around Amsterdam by Night. The crowdfunding for the photobook has been a success and several shops in Amsterdam now have postcards of Amsterdam by Night available. I also took the time for several nightly photo expeditions through the city. This resulted in some nice new series, but also meant I could not take the time I would like to spend on maintaining the website and facebook page. 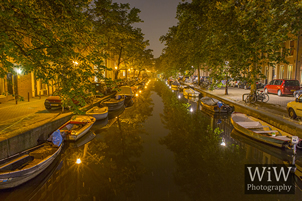 Today there is a new Spotlight on the Jordaan. I can also recommend having a look at all the photos on facebook to see if you miss a part of Amsterdam. Let me know via a message on the contact page and you might see it back soon on Amsterdam by Night. The crowdfunding to create the photobook "Amsterdam by Night" was successful! I am very grateful to everybody who believed in this project and made a donation. More news will follow soon. The website and facebookpage of Amsterdam Dichtbij placed a nice article about Amsterdam by Night. To celebrate the 3-2 victory of the Dutch team against Australia, they showed the photo of the huge football at sportspark Spieringhorn. Amsterdam Dichtbij has a daily section called "Goedenacht Amsterdam" (Goodnight Amsterdam), that publishes night photos of Amsterdam at midnight. Amsterdam by Night was already featured before with a photo of the Slangenpand (Snake house). The following period will see more from the Amsterdam by Night series at Amsterdam Dichtbij, so be sure to have a regular look at their website. Are you looking for a special postcard of Amsterdam, have a look at one of these locations and support both the local shops and Amsterdam by Night. Of course the postcards are also available via the "Prints" section on this website. In order to support the crowdfunding for the photobook "Amsterdam by Night" there are two sets of 8 postcards available in a limited supply of 250 per set. The postcards are available as two separate sets of 8 cards or as a set with all 16 cards. You can order the cards via the order form above. Packaging and shipping costs for the cards is 3,- in the Netherlands and 5,- for worldwide delivery (price in euro). If you order your postcards before the 28th of June they will be delivered free of charge in Amsterdam. The sales revenue will be fully used to support the crowdfunding of the photobook. From the 17th of June till the 11th of July you can visit "Amsterdam by Night" in the district city hall (stadsdeelkantoor) of Amsterdam-West. This is the first time that the project can be seen in public. The 16 prints of nightly Amsterdam are on display in the central hall. For everyone who want to have a look: the exhibition can be visited during workdays between 08:00 and 17:00 (on Thursdays till 20:00). The adres is Stadsdeelkantoor Amsterdam-West at Bos en Lommerplein 250. All prints are displayed on DiBond (40x60 cm) and are available for purchase fro 250,- euro a piece (available from the 12th of July). The revenue is fully used to fund the printing of the photobook "Amsterdam by Night". View the exhibition and maybe I see you there. Enjoy and have a look!